Cosco JK-3955 Exercise Bike is a commercial spin exercise bike. 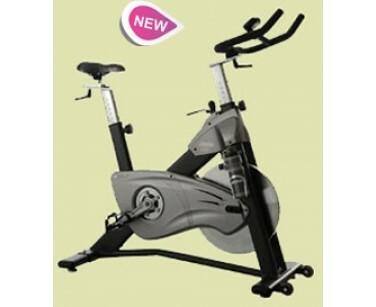 It has superb features like a LCD computer with function of scan, time, speed, distance, calories, pulse, emergency V-break with tension controller, horizontal micro adjustable seat / handle bar, 6 ranges height adjustable front post and quiet poly belt drive.It has 30kg and 450mm stel flywheel, sturdy oval tube construction with sweat. 30 Kgs.450mm dia.CNC Steel Flywheel. 6 ranges height adjustable front post. Quiet poly belt drive, fixed wheel system. 11 ranges height adjustable seat post. Horizontal micro adjustable seat / handle bar. P.U. transport wheel for easy movement. 3 Pc. 5 teeth heavy duty crank. fender to avoid rusting on Fly Wheel. Emergency V-break with tension controller. One LCD computer with function of scan, time, speed, distance, calories, pulse. Net weight : 62 Kgs. *Note: Most of the sites, stores or shopping portals listed above sell Cosco JK-3955 Exercise Bike with discounts and other exciting offers. There is a possibility that the some of above websites are not selling Cosco JK-3955 Exercise Bike now. Toughtrain.com is not liable for such cases or instances. Also we do not recommend any seller for Cosco JK-3955 Exercise Bike and a buyer should buy from where he/she gets best deal with quality of products, service and on time delivery (shipment).